Go F*ck Yourself, Cian! is a laugh-out-loud alternative relationship guide by Facebook's favourite comedian, Cian Twomey. Fine, nothing, and okay are three words when used by your partner, that are guaranteed to make a man's testicles shrink in fear - and so they should according to Cian Twomey, Facebook's favourite comedian, whose imaginary other half has threatened to push him into a well and when all else fails hopes he chokes on his own slice of pizza. What did Cian do to deserve such atrocities? A lot - according to erratic Emily, the difficult other half to Cian's own personality. 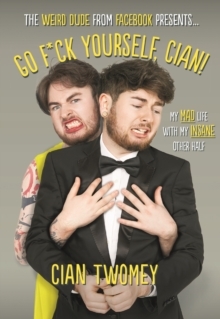 Go F*ck Yourself Cian is the relationship guide for you, no matter your status; single, friends with benefits, loved up, or ashamedly whipped, this book holds the answers. Learn what to do with Cian's practical advice, from that awkward first date to that even more awkward first fart. Learn what not to do with Emily's not so helpful interjections and high maintenance demands, and get to know the real Cian and Emily and their heart-warming romance.